This post isn't going to be funny. Not even slightly. But I'd still like you to read it. Today Aunty Penny and I attended the 20th Annual Silent Domestic Violence Memorial March at the Stirling Gardens in Perth city. 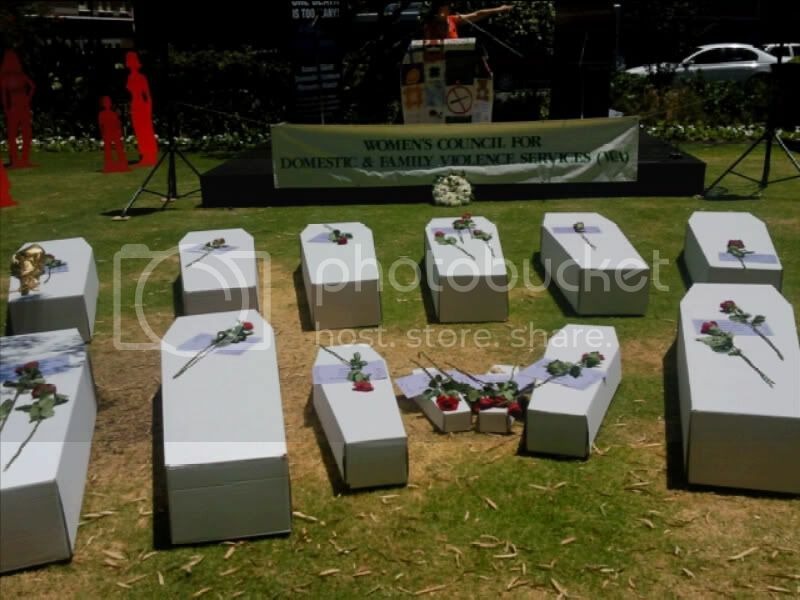 It was dedicated to all those who have lost their lives as a result of domestic homicide in Western Australia in the previous year... 15 people. 15 too many. On the ground in front of the stage there were 15 white coffins displayed. There were two smaller coffins for children. And right in the middle there were two tiny coffins. Some of you may remember, because of the giant media circus at the time, that those coffins represent seven month old babies. Twins. Lachlan and Sophie. I sat on the grass, in front of the tiny coffins, playing with Tricky's feet while he smiled and babbled away, unaware of the somber mood of the crowd. I had a massive lump in my throat. I was consumed with thoughts of Tricky - almost the same age as the twins... but I could not even imagine what it would be like if he were gone. My mind simply cannot process it. So seeing those tiny coffins, knowing that someone had murdered those innocent babies... I could not contain my sadness. My chest was on fire and my stomach ached... and I wept. I felt embarrassed - I was, after all, crying over people I had never met before. But when I looked around, there were a lot of other people crying too. 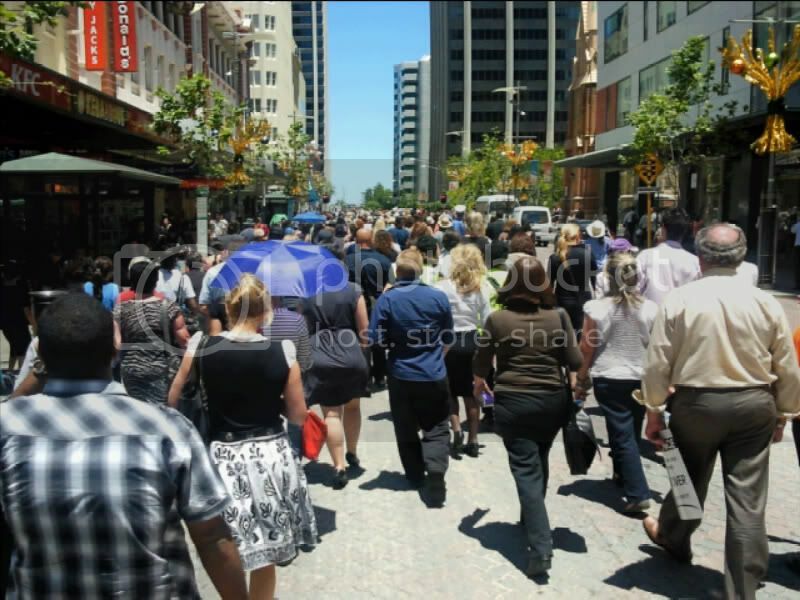 The few hundred people gathered then walked the streets of Perth in silence. Men, women, children. Gay, straight. Christian, atheist, Muslim. Black, white and every shade in between. All were represented because all are touched by this horrific crime. Today's march was silent. But if you, or someone you know is experiencing domestic violence then don't be silent any more. For a list of resources in your state, visit ReachOut Australia. Well done babe well done. I feel an awesome proud feeling for you right now. That is a wonderful thing not only attending, but taking time to blog about it. U rock. Funny isnt always important.... not always needed.. you just blogged about a real life issues an issues many just ignore... cause its to hard to except that this sort of thing goes on in our day and age... I did in fact cry reading your post... I to cried at the tiny coffins... just to sad to even have the words to describe how this makes me feel...Thanks for sharing and bring a subject to light today. I am pretty speechless on this one. But I have tears for those 15 people... especially those little babies... I am crying for them too. Thanks, Kristie. Can't wait to hear news today of Fiona. Thanks, Rlburbee. Finding the words was very hard. Hopefully there won't be any at next year's march. I was really unsure if I should write about it, but these lovely comments make me happy that I did. Thank you, Glen. That means a lot to know it's OK to talk about the heavy stuff sometimes (and not lose my readership). Think of all those women (and children) out there who are silent to this crime. Good for you for attending and showing support. You are so right. Bones heal, bruises fade. But the words that someone says to you (or don't say to you) can last a lifetime. There was a fabulous guest speaker at the event, a survivor, and she spoke so eloquently about how it was her husband's words that wore her down more than the beatings. It's quite horrifying to think of how much is not being said. I am speechless, too, but I thought I'd comment anyway, just to show support for your message. That photo is one of the saddest things I've seen in a long time. That is awful, I hate that people could do that to a small child a baby. It's so hard to fathom. I wasn't mad when I was at the march, probably because I was a bit teary but when I got home I started feeling really angry about it all. Thank you for reading, Wanderlust.